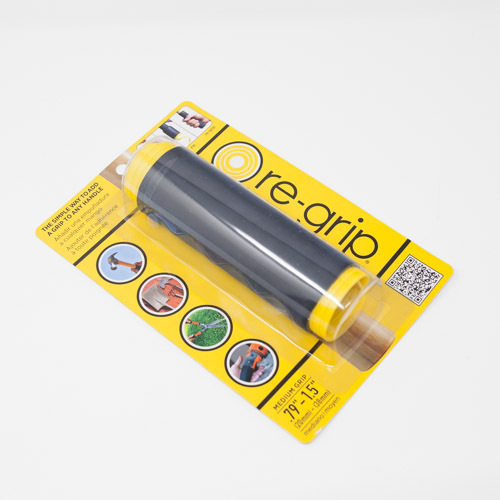 RE-GRIP adds comfort, durability and safety to almost anything with a handle. Provides a method of improving a handle grip by adding mechanical and environmental protection when installed on a variety of cylindrical and semi-cylindrical objects such as hand tools, garden tools, sports equipment, handle bars, wheelbarrows, levers, flashlights and much more. Ergonomic design relaxes grip and reduces muscle fatigue. Helps prevent blisters and is non-slip for better control and safety. Installs in seconds and constricts to handle completely providing a hermetical seal. - Fits Handle Sizes: .69" to 1.5"